Jim and the Muppets made appearances on the various incarnations of The Tonight Show as early as 1956. The debut of The Muppet Show warranted promotion on Johnny Carson’s Tonight Show in September 1976, so it was no surprise that Jim and his gang were invited back the following fall for the start of Season Two. They previewed Kermit’s feat of tap dancing, “Happy Feet” which would be part of the Madeline Kahn episode, and Carson bantered with the irrepressible Link Hogthrob. Jim also appeared on camera as part of the entertainment. Clearly, the Muppets were at home in Carson’s studio and less than a year later, Kermit was asked to sit in the host’s chair, filling in for Johnny. Learn more about it. 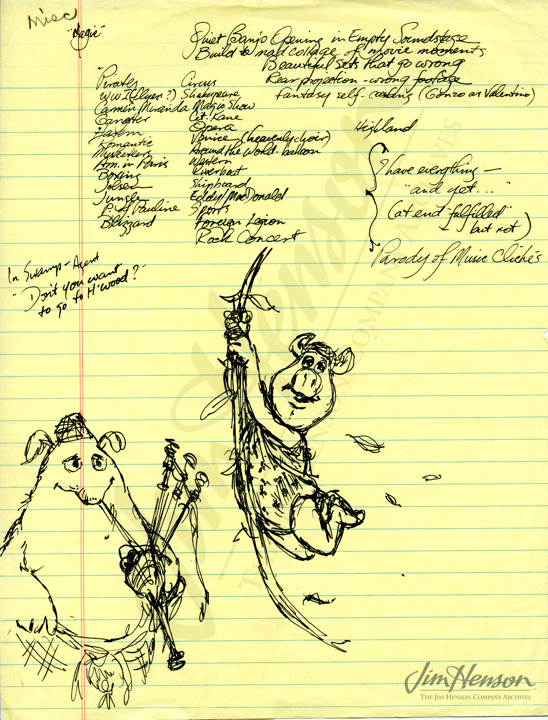 Michael Frith’s doodle of Link Hogthrob as Tarzan on some Muppet Movie notes, 1978. Capt. 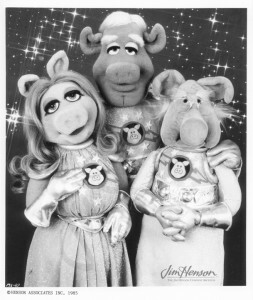 Link Hogthrob with his “Pigs in Space” cohorts First Mate Piggy and Dr. Julius Strangepork in a Muppet Show promotional photo. 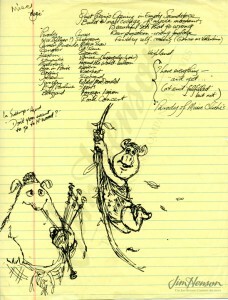 This entry was posted in 09-September '77 and tagged The Muppet Show, The Tonight Show. Bookmark the permalink.